Elizabeth II D G Reg F D, starting south-west, running to south-east, the "D G" starting to the right of the crown, with "Fifty Pence" in smaller letters running along the gap at the bottom. Elizabeth II Dei Gra Reg Fid Def Date, starting top right. 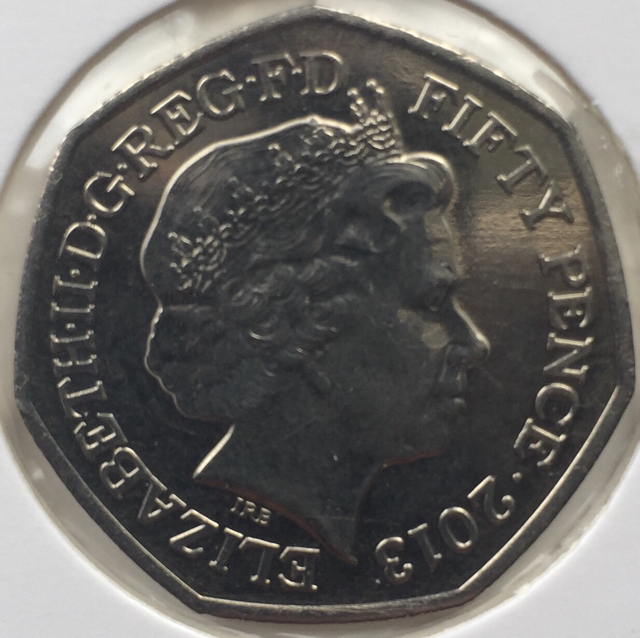 Introduced in October 1969, the Fifty Pence had the same obverse as the 5p and 10p coins already issued. Almost. 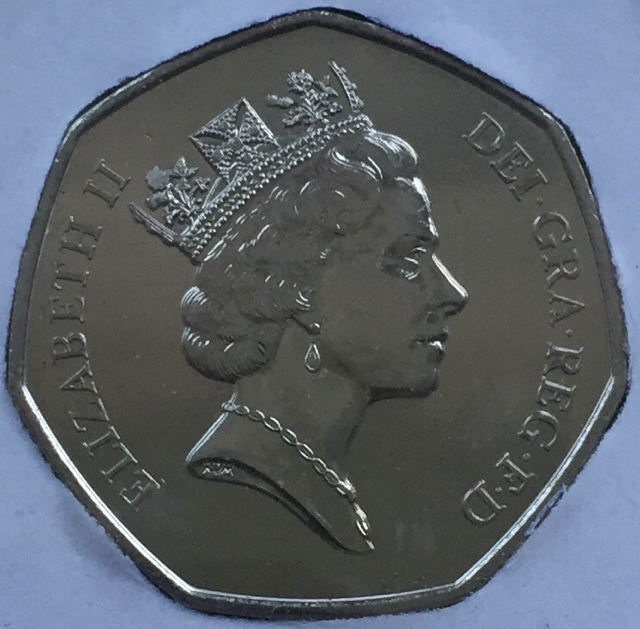 Due to the shape of the coin and the style of the Queen's portrait, the legend is positioned very slightly differently to how it appeared on the other five denominations issued at decimalisation. 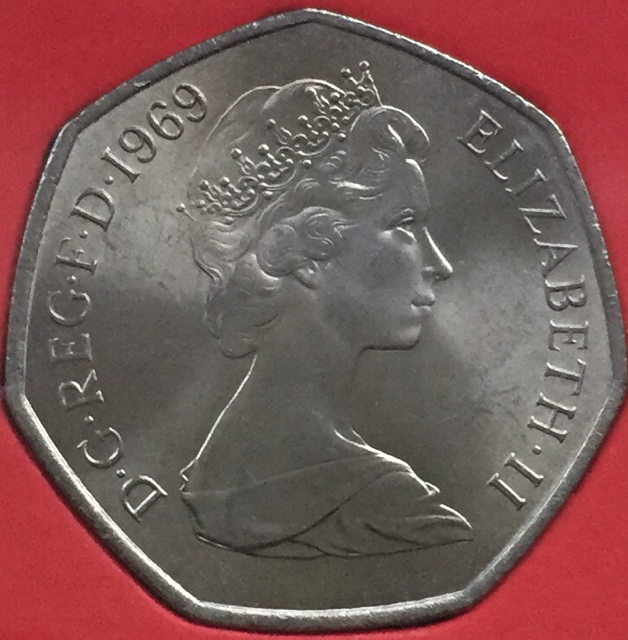 This 50p obverse with the Arnold Machin portrait of the Queen was used from 1969 to 1972 and 1974 to 1984 (though some dates were not struck for circulation). Only the Ian Rank-Broadley portrait lasted for longer on this denomination (by two years). I've included the 5p obverse for comparison. 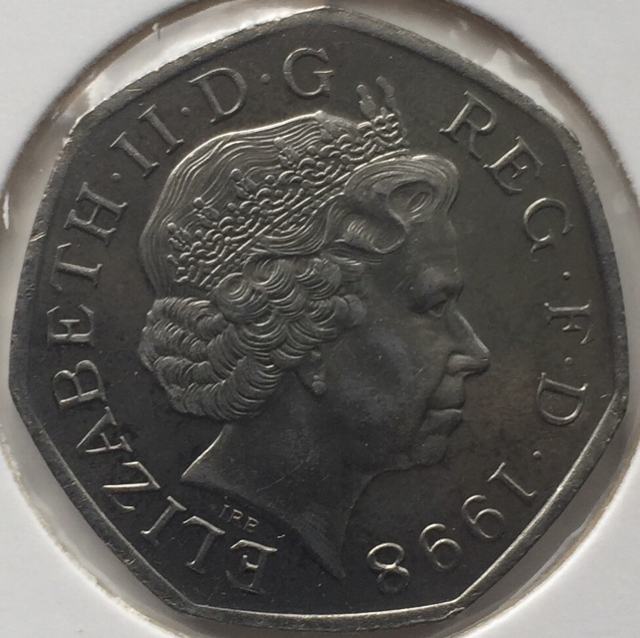 It's difficult to pick out, but if you concentrate on one part of the inscription, such as the "H" of Elizabeth and the "II", you may notice that on the 50p, the gaps between the H and the II and the portrait are roughly about equal (ignoring the centre dot). On the 5p, the gap between the H and the II is smaller than that between the II and the portrait. 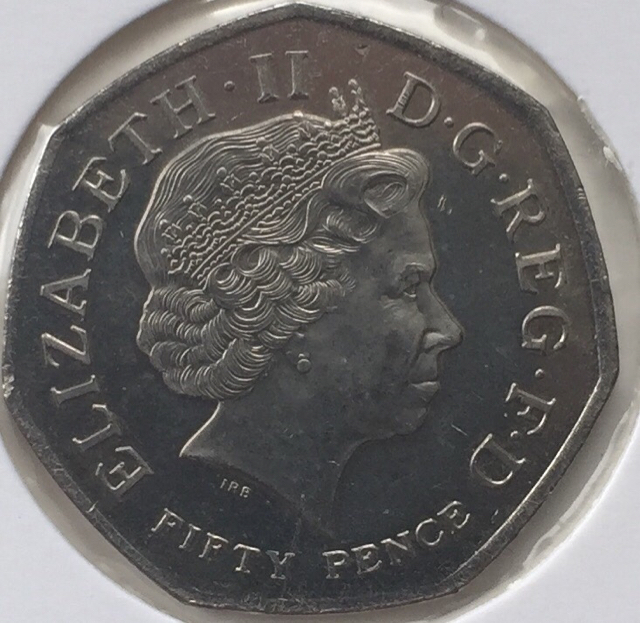 This is partly because the portrait should go lower, but doesn't because the points of the cut would be too close to the rim (it comes close to that on the 5p though). Also, the second "9" of the date on the 50p is further away from the portrait than the "8" is on the 5p. Used in 1973 for the EEC "Ring of Hands" commemorative, this obverse is similar to the first one but minus the date, which appeared on the reverse. The Queen's titles are spread out more so that they fill roughly the same amount of space, but also the centre dot between "Elizabeth" and "II" is missing. "Elizabeth" appears to start slightly higher as well. 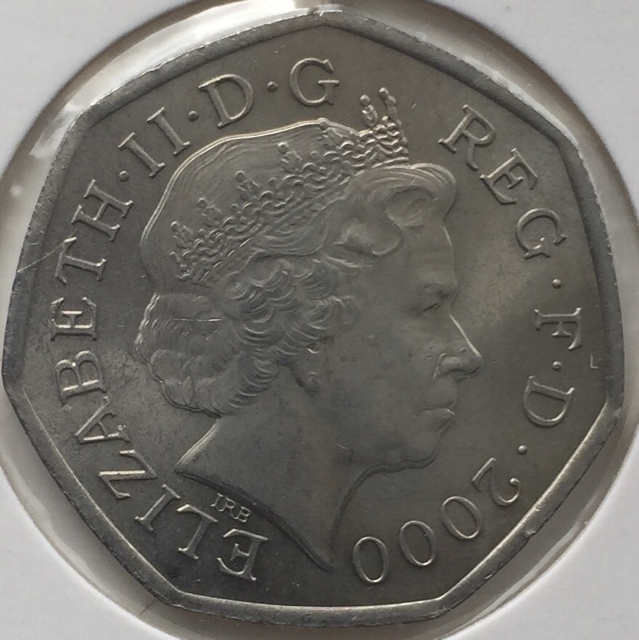 It would seem that the reason for the differences, particularly the missing middle dot, is because the obverse is actually the same one that was used on the 1972 Silver Wedding 25p Crown (also used for that denomination in 1980 and 1981). The later Maklouf obverses also had no middle dot here. 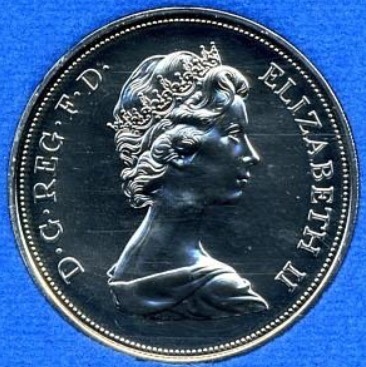 Obverse 3 was introduced in 1985 for the new Raphael Maklouf portrait of the Queen. Unlike the Machin version, the inscriptions are placed in the same position as they are on the round circulating denominations. This is because the cut of the neck on this portrait allows more flexibility than the one on the Machin, enabling it to be easily adapted to a non-circular coin. Although used from 1985 to 1997, including the 1994 commemorarive, this obverse was rarely seen in circulation until the 1997 reissue as a smaller coin. Fewer than 700,000 Britannia large-size 50p coins were issued to circulation (all dated 1985). 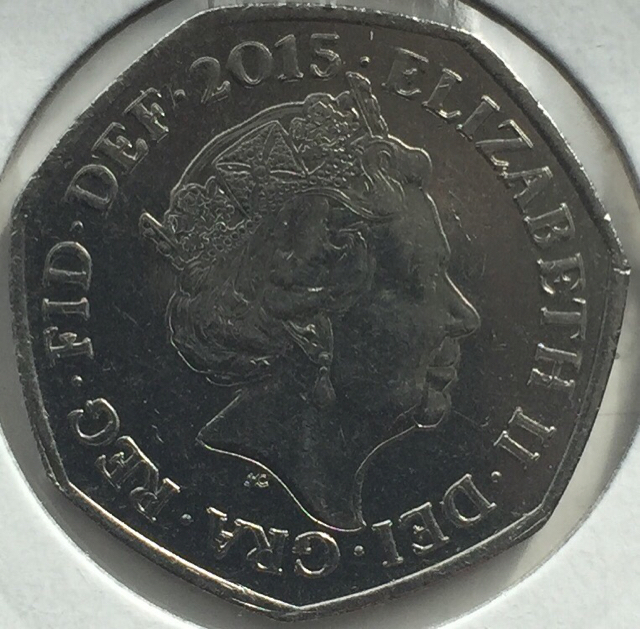 The 1994 D-Day commemorative was the only large-size 50p special edition to use a standard obverse. About 6.7 million of that version were issued to circulation. The final large-size obverse variant, Obverse 4, was used for the 1992-1993 double-dated EU (then known as the EC) conference table commemorative. The Maklouf equivalent of Obverse 2, this version has a slightly expanded abbreviation (Dei Gra instead of D G) in order to fill roughly the same amount of space. The Machin version kept the short abbreviation but spaced out the lettering. This obverse was used on the rarest 50p of all. Just 109,000 of this type were struck for circulation (101,000 fewer than Kew Gardens). It's also the only large-size commemorative to be issued alongside its standard Britannia counterpart (albeit only in sets) in both years of its issue. 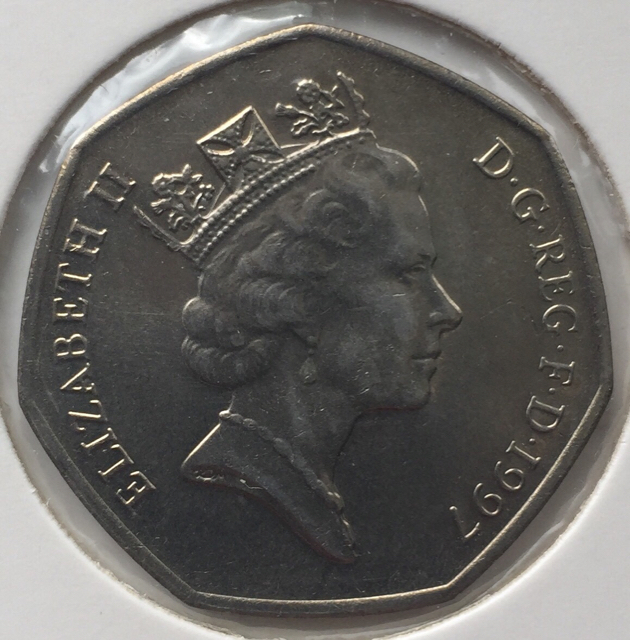 In contrast, no large-size Britannia 50p coins dated 1973 or 1994 exist (trial Britannias were struck in 1994 as tests for the smaller coin in both heptagon and round shapes, but these stated "Royal Mint Trial" and were not available to collectors). 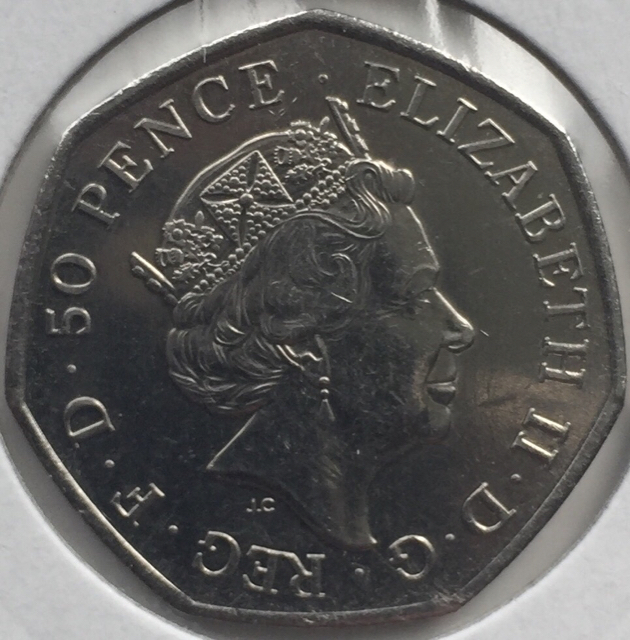 The smaller 50p was introduced on 1 September 1997 in order to fit in with the existing range of coins following the reduction in size of the 5p in 1990 and the 10p in 1992. 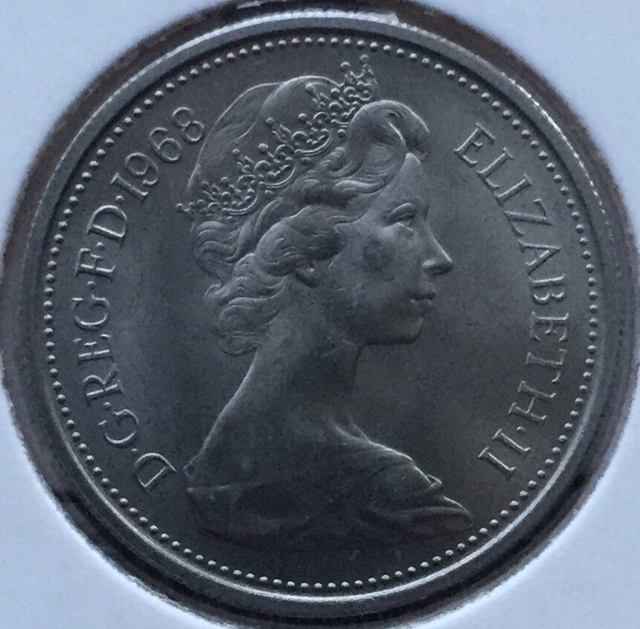 The obverse was a straightforward transfer of the large-size obverse 3 of 1985 to 1997, but on the smaller coin it turned out to be a one-year type. 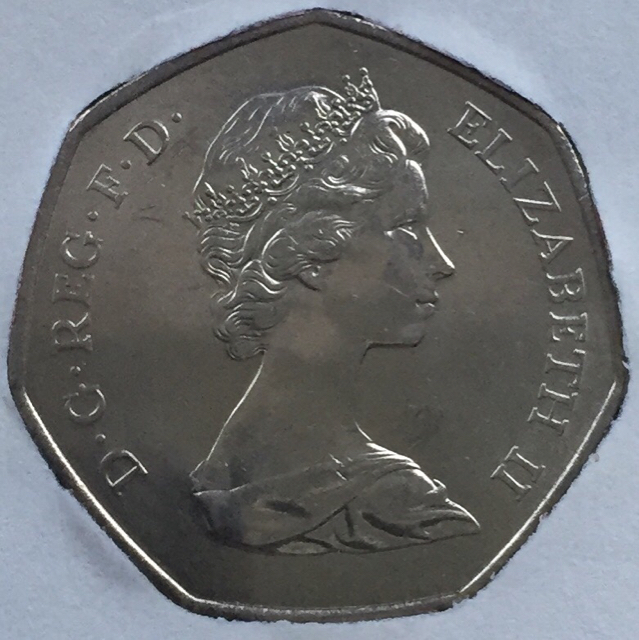 The Raphael Maklouf portrait was in its 13th year, but it took until the introduction of the smaller 50p for it to be widely encountered on all seven circulating denominations (the Maklouf bi-metal £2 dated 1997 was issued "post-humously" in 1998). In contrast, the Rank-Broadley portrait was widely seen on all denominations within three years, and this is almost the case with the Jody Clark version. Although a one-year type, it is still commonly encountered as it was issued in massive numbers. This was due to it being required to replace all existing large-size 50p coins in circulation prior to September 1997. 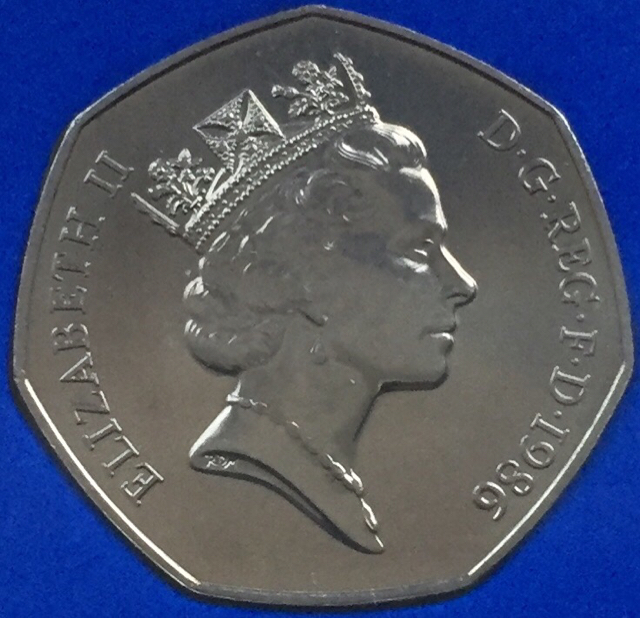 The new 50p had been in circulation for under two months when it was announced that, after just 13 years, the Maklouf portrait would be replaced in 1998 with one by Ian Rank-Broadley. With smaller coins having been introduced, there was a preference for a portrait and corresponding inscription that filled the entire field of the coin, enabling it to be easily read on even the smallest coin (the 5p). For the first time, the Queen would be easily recognisable. The Rank-Broadley portrait just managed to become the longest-running effigy of the Queen, beating the Arnold Machin one by one year (though the final year was split between this one and the Jody Clark). After two years of the new obverse, it was apparently decided that the inscription was a little too close to the edge. Obverse 2b shows the modification that was introduced in 2000, and used thereafter. Not easily noticeable, but concentrating on one or two letters (the "D" of D.G. or the "T" of Elizabeth) will give away a slightly bigger gap between the letters and the rim on the 2000 and after version. This must mean that the entire design is very slightly smaller. 2000 Public Libraries, 2003 Suffragette, 2004 Four-minute mile, 2005 Samuel Johnson's Dictionary, both 2006 Victoria Cross, 2007 Scouting, 2010 Girl Guiding, all 29 Olympic coins (dated 2011), 2013 Christopher Ironside and 2015 Battle of Britain (sets only). This final edition used somewhat modified lettering (more on that later). After 39 years (with 38 of 40 dates existing in some form or other), the Britannia design was finally replaced, along with the original (or 1982 modified) designs of all the denominations from £1 to 1p. The Coat of Arms "shield" design was adopted, split across six of the coins, and the 50p got the bottom segment with point. This design worked much better if the orientation of the coin was turned a full 180 degrees, moving the upright "point" of the heptagonal shape from the top to the bottom of the coin. The obverse is simply Obverse 2b effectively turned on its head, and therefore does not warrant a separate number altogether so has been designated Obverse 2c. It appears that this orientation is purely to accommodate the Dent design, as all commemoratives produced since have continued to use the original orientation. If the "pointy top" remains the default orientation, it means that a standard design coin is being issued in a non-standard format. It must be assumed that commemorative designers are given the brief that the orientation has to be the default pointy top. The Kew Gardens coin of 2009 is notorious for being the rarest current coin in circulation (the large-size EC commemorative 50p of 1992-1993 was more rare in terms of numbers struck for circulation). The Kew Gardens one is also significant in being the first 50p ever to contain the denomination on the obverse instead of the reverse. 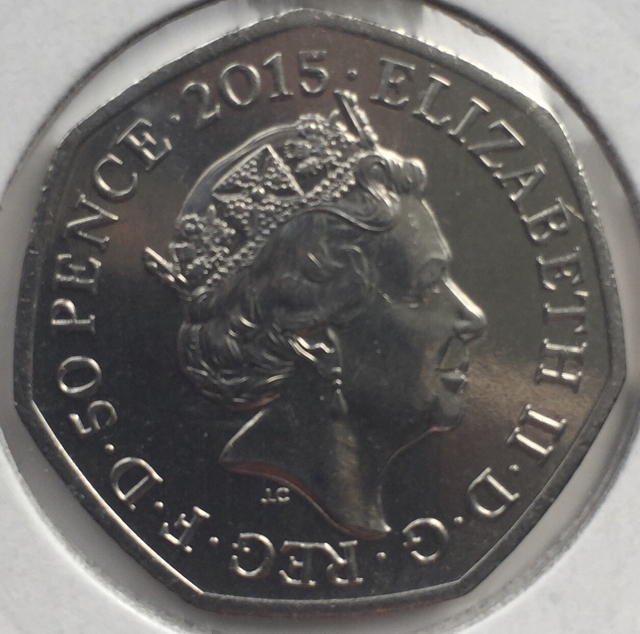 It's additionally the first 50p since that 1992-1993 EC version not to include the date on the obverse. This design went on to be used on the 2011 World Wildlife Fund and 2014 Commonwealth Games commemoratives. The design is perhaps not particularly aesthetically pleasing, as it mixes different sizes of lettering, but it depends on personal taste. After the £2 coin had abandoned a compulsory standard obverse in 2007, it was perhaps no surprise that the 50p would follow suit. It was, however, perhaps a relief for some that the original orientation was retained for the first commemorative produced since the new Matthew Dent standard reverse had been introduced. Whilst the mix of large and smaller sized lettering on Obverse 3 might have looked a bit awkward, it was nothing in comparison with what was to come in Obverse 4. Whilst it restored the lettering to being all in the same size, it also had to contend with the addition of the date. The natural breaks in the inscription, the crown and the neck, force the Queen's name and titles to be squashed into the left-hand side. Introduced for the Benjamin Britten commemorative of 2013, it was curiously not used again. The 2015 Battle of Britain coin desired an obverse with both denomination and date, but instead, an oddly modified version of the former standard Obverse 2b was used, resulting in a 50p without its denomination on either side (though not intended to circulate in that version anyway). After 18 years (or rather, 18 coin dates), the Ian Rank-Broadley obverse was retired during 2015. A not-totally dissimilar portrait by Jody Clark was chosen to replace it. 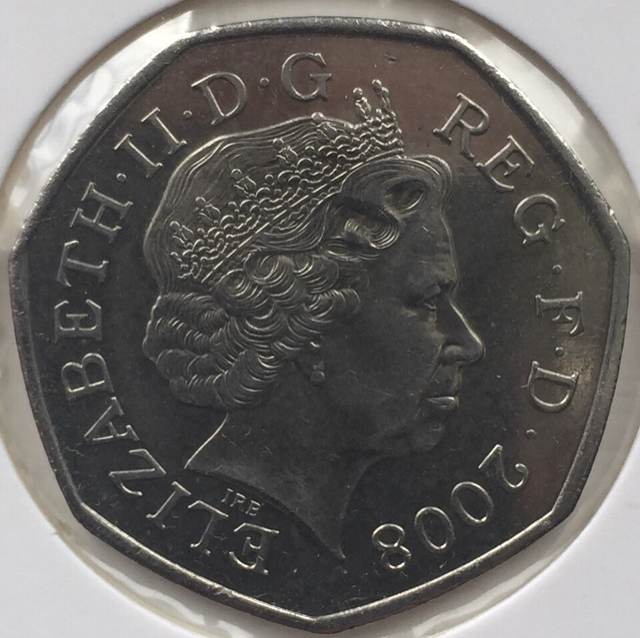 At the same time, it was decided to expand the abbreviations of the Queen's titles to what they had been on the standard £2 coin, 1998 to 2015, but with the retention of the date. For the first time since the Arnold Machin obverses, the legend starts top right instead of bottom left. The middle dot between "Elizabeth" and "II" has been removed. It was present on the main Machin version, missing from the Maklouf but reinstated on the Rank-Broadley. Is there a pattern forming? Introduced on the standard Dent issue in 2015, Obverse 5 has finally made its debut on a commemorative for the Isaac Newton edition of 2017 (as Obverse 5b, observing the difference in orientation). The denomination-less, Ian Rank-Broadley sets-only version of the 2015 Battle of Britain commemorative was, in common with other commemoratives that year, only struck for circulation with the new Jody Clark obverse portrait. For this version, the missing denomination was restored. To this end, Obverse 6 is the Jody Clark version of the controversial Obverse 4. Much more successfully done for the new portrait, the "Fifty" was changed to numeric and, with a less prominent crown and neck, the inscription could be spread out more evenly around the coin. Obverse 6 was used again for all five Beatrix Potter commemoratives of 2016, as well as the Team GB version from the same year. It was further used for all four 2017 Beatrix Potter commemoratives and the 2018 Representation of the People Act version, along with the four 2018 coins in the Beatrix Potter series. Obverse 7 was introduced in 2016 for the Battle of Hastings commemorative and is effectively the Jody Clark version of Obverse 3 (again done more successsfully as all lettering is of the same size). Although there's no date to have to accomodate, it's still the short version of the abbreviation of the Queen's titles that is used, meaning a slightly more spaced out version of the legend than even the current standard obverse can offer. Obverse 5b is simply the commemorative version of 5a, used for the default pointy top orientation. First used on the Isaac Newton commemorative of 2017, this version shows us what the standard obverse would have looked like had either the Britannia reverse been retained, or a different new design adopted in 2008 that didn't require the orientation to be changed. 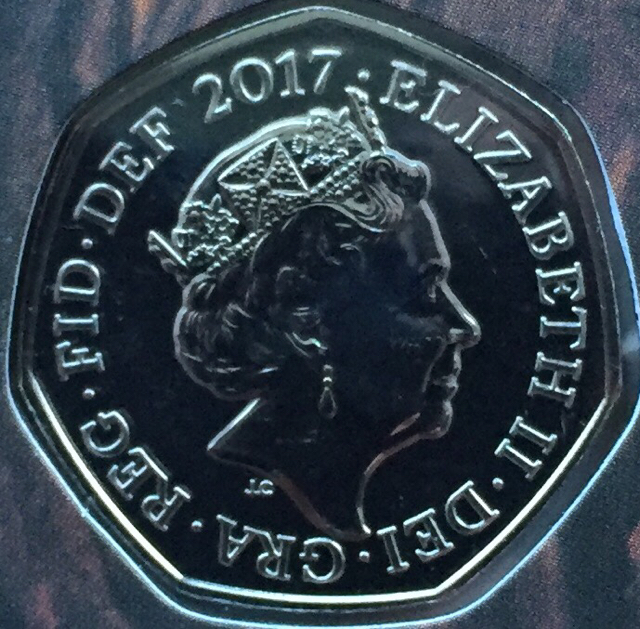 Closer inspection of this obverse reveals the the middle dot between "Def" and "2017" appears to be missing. Perhaps this will be corrected for the circulating version. (Note: The mark shown between the Def and the 2017 is not an error on the coin itself but on the photo).